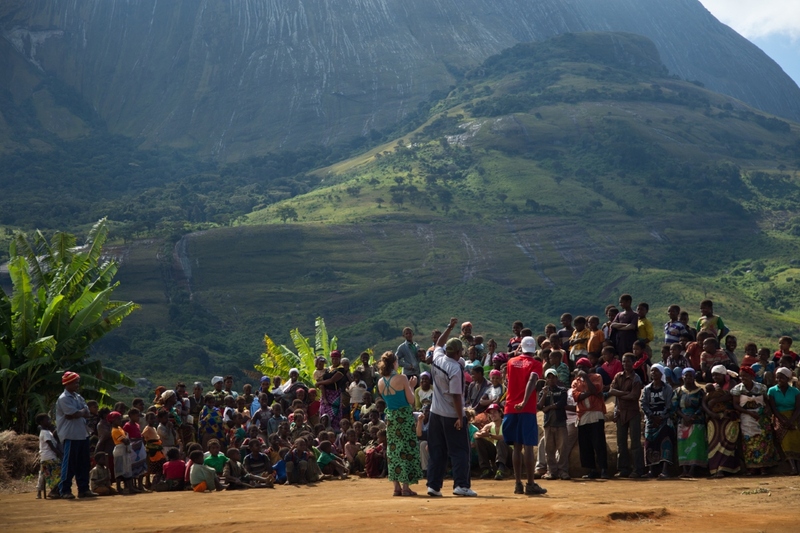 To conserve the vital environmental, cultural, and ecosystem service values of Mount Namuli. 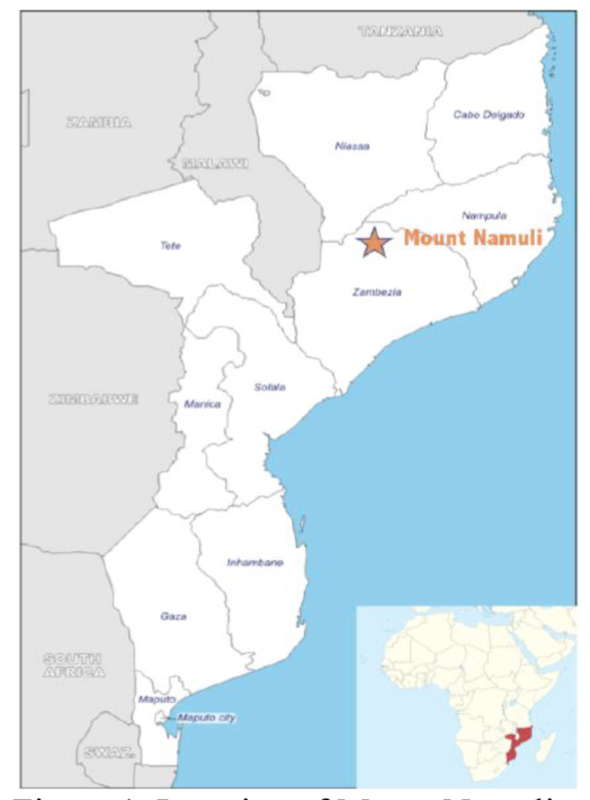 The Namuli massif covers an area of roughly 200 km2 at elevations above 1,200 m. Incorporating a complex of granitic inselbergs (think… islands in the sky) linked by the high Muretha Plateau. Recognized as one of the most important biodiversity areas in the country, the habitats are a mosaic of East Afromontane Ecosystem forest and grassland communities above 1700m, interspersed by shrublands, shallow soil plant communities with smooth rock peaks. Central to this system, Mount Namuli rises as the nation’s second tallest peak, reaching 2,419 m (nearly 8,000 ft.) and supports patches of unique high altitude forest and numerous endemic, range-restricted and threatened species. Mount Namuli is designated as a Level 1 Priority Key Biodiversity Area by the Critical Ecosystem Partnership Fund, an Important Bird Area, an Important Plant Area, and an Alliance for Zero Extinction Site. Despite these distinctions, the area lacks any formal conservation protection. The lower elevation areas that surround Mount Namuli are settled and intensively cultivated. Although there are no settlements in the highest reaches of the mountain, some potato farmers have started to clear upland forests in recent years, a practice that has escalated in the past five years. Analysis of satellite imagery indicates that overall forest coverage has been reduced by one-third in the past ten years, a rate of clearing that would expunge the remaining forest within eight years. Also impacting Namuli’s biodiversity and general ecological integrity are uncontrolled fires, often resulting from slash and burn agricultural practices. Overhunting of limited wildlife needs to be regulated. The solution is to protect a core zone of the massif and put in place good governance, effective local leadership, and sustainable management of the remaining patches of high altitude forest. ICFC is supporting the training component. This will represent one of Mozambique’s first community-managed conservation areas. As well as protecting the critical biodiversity and ecosystem services of the core area, implementaion of agricultural best practices will minimize erosion and support retention of flow from rivers that originate on the Namuli massif. The project also aims to provide durable livelihood options for Namuli’s communities. Core zone: 5,600 ha, Transition zone: 47,300 ha. This short film discusses the crucial role of Mount Namuli forests in providing water.